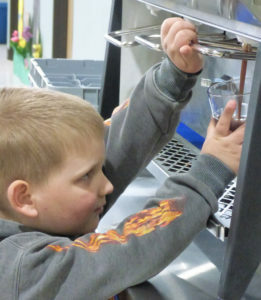 This high environmental cost is one reason Payne is excited about the Silver Falls School District’s recent interest in implementing milk dispensers in as many schools as possible. But the real impetus for a move toward dispensers in the district came two years ago, when Butte Creek Elementary School began working toward becoming an Oregon Green School – a move that required they document their waste reduction initiatives. “Garron Lamoreau, a social studies teacher, he started a movement that we called the Green Team,” Butte Creek Elementary School Principal Kevin Palmer said. Lamoreau also placed a call to the Clackamas County Waste Reduction Coordinator asking what more could be done. He was told about a milk-carton reduction initiative that provided half of the funding the school needed to get the program started. It’s not just the Butte Creek students who think that milk from a dispenser has a better flavor. Payne – who has been following studies across both the district and the state involving milk carton reduction – said students generally agree that dispensed milk is better. Because Butte Creek Elementary School lies outside of Marion County lines, it has not been included in Payne’s studies but both Silverton Middle School and Scotts Mills School have been pilot schools for the program. Butte Creek too has seen a marked decline in milk-waste. That reduction in dairy waste is really important, according to Payne, because each gallon of milk is equal to 0.7 gallons of gas in terms of its impact on the environment. And every gallon saved preserves 291.5 gallons of water, which would have been used in the production of that milk. But reducing carton use is important too, which means the savings don’t stop there. As encouraging as this preliminary data is, there are still a number of schools in the county who don’t have access to dispensers. Payne said his department hopes to remedy that by placing 20 additional dispensers in schools over the next two years. Although much is currently being done at the state government and district level toward waste reduction in schools, Payne said the real benefit might actually be in the education these programs are providing to the students. “[S]tudents play an important role,” he said. “They are often the ones in families that take out the garbage and recycling, so teaching them at school how to recycle right and why preventing food waste is important has ripple effects outside of the classroom.